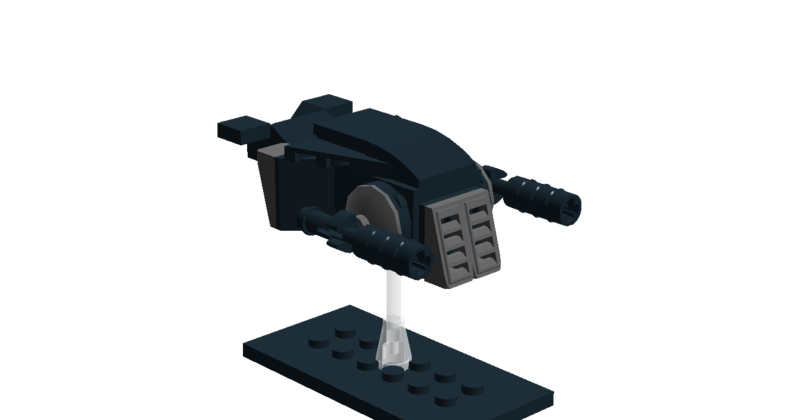 The Damselfly is an early frigate design by a fledgling frontier alliance known as the Chandaran Coalition, later authorized for export to various other factions. The chassis was initially designed as an asteroid mining ship and cargo hauler, the port and starboard turret hardpoints originally intended to be equipped with mining equipment such as anchors to latch onto asteroids, or high-powered mining drills for ore extraction. When it was rebuilt as a warship, the turrets were redesigned as two independently controlled weapon mounts, each bearing a medium Mass Driver cannon. The ship was also equipped with a heavily armored prow that still allowed decent visibility thanks to multiple strategically placed viewing slits. Overall, the Damselfly is a ship notable for its agility as well as its firepower at assault ranges. It was also the first Chandaran design to mount the then-newly developed Mass Driver cannons, which would become the standard assault-range weapon system for many of the region's later designs. Really nice, I used a similar core with my interceptors, might give the concept another shot! VitorFaria wrote: Really nice, I used a similar core with my interceptors, might give the concept another shot!